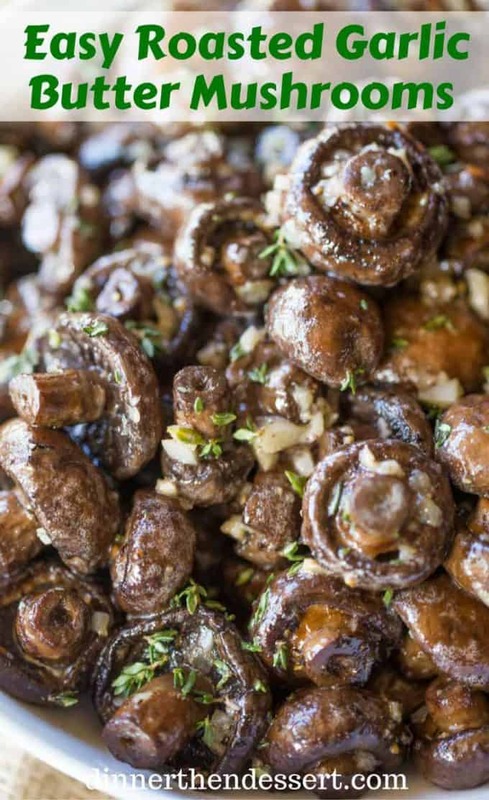 Garlic Butter Mushrooms so easy to make and such an impressive side dish your guests will love for your favorite holiday meal or dinner party. 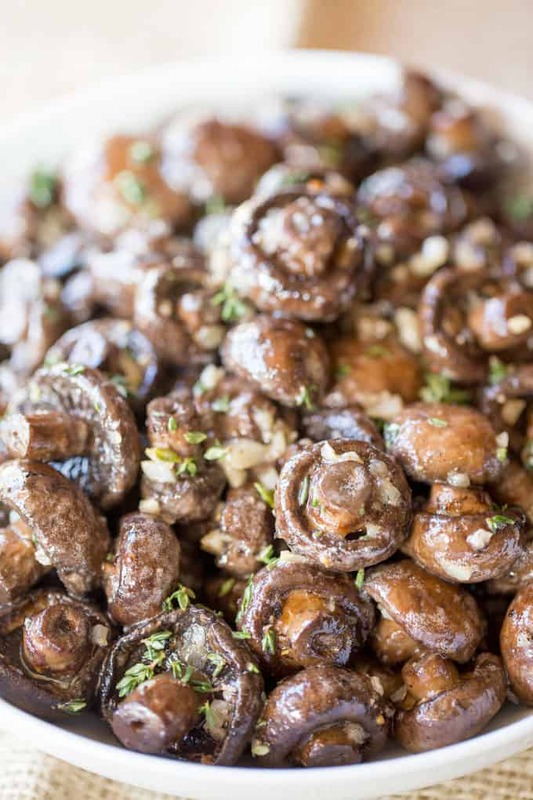 Garlic Butter Mushrooms are a quick and impressive side dish that are a staple for meals in our house where steak is served. They roast in the oven just like your favorite vegetables would and after a quick toss in some butter they are ready to be served. 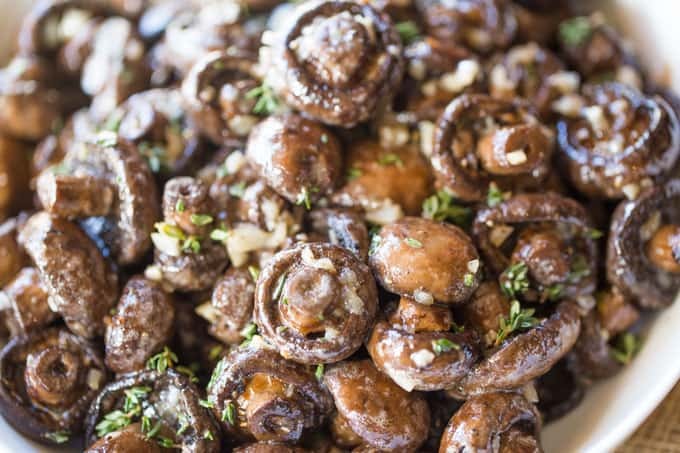 This year we served these Garlic Butter Mushrooms with the Perfect Prime Rib, Perfect Potato Latkes and my kid’s favorite dish to help me make, Rainbow Roasted Vegetables. It was an easy menu since the Garlic Butter Mushrooms and the Rainbow Vegetables were roasting in the oven along side the Prime Rib. Then I just had to give my undivided attention to my latkes and a holiday meal was done. 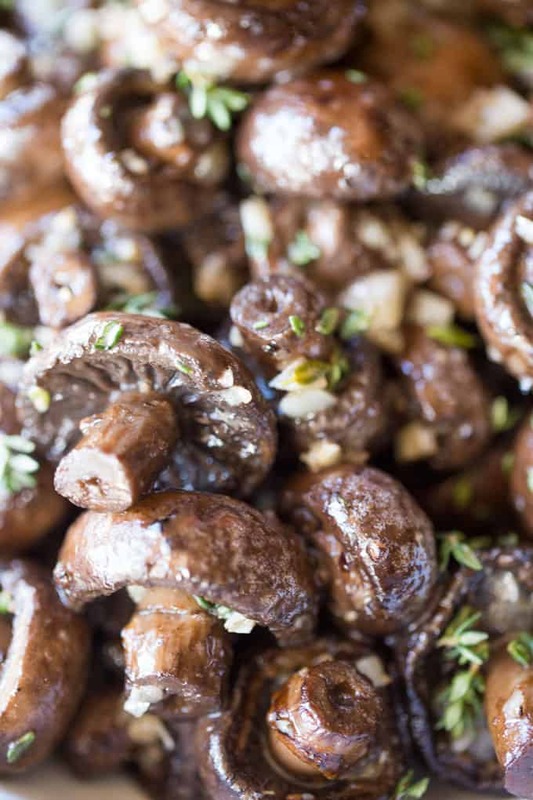 This Garlic Butter Mushrooms recipe is so popular in our house even people who swear they hate mushrooms always end up taking seconds. 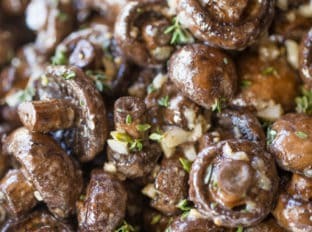 It also happens to be a perfect basic recipe for how to cook mushrooms for other dishes. 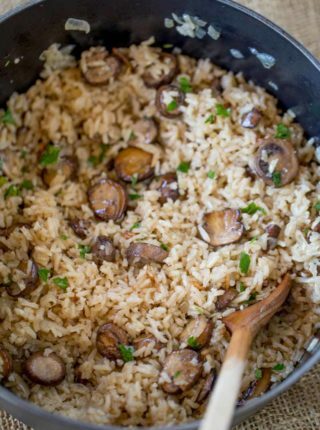 When it comes to preparing these mushrooms I just brush the tops of them clean and cut a tiny bit off the bottoms of the stems. 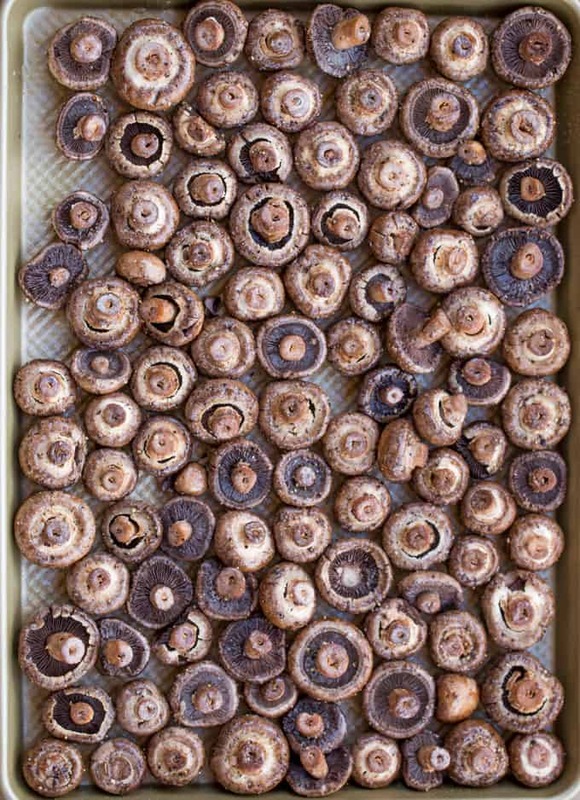 As a kid I used to watch my mom peel the tops of the mushrooms completely off so I thought that was the way to clean them until I was working along side a chef who saw me peeling the tops of the mushrooms in horror and asked me what I was doing. Since learning I didn’t have to peel the tops I use mushrooms much more often now, they take almost no time at all! 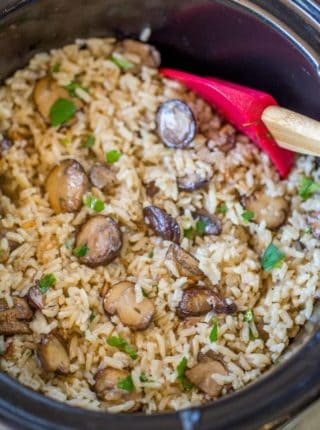 Brown some chicken breasts in a skillet, deglaze with a bit of white wine and chicken stock then add these mushrooms to the pan. Chop or slice up the mushrooms and add them as a topping to your favorite burgers. Add them to omelets, they’re the perfect filling. Cut some puff pastry into 3-4 inch squares, spread with cream cheese (leave a half inch border) and pile these mushrooms on top of the cream cheese. Bake in a preheated 400 degree oven for 18-20 minutes and serve as an appetizer. Top some crostini with some of these mushrooms and some blue cheese crumbles. Sheet Pan: A good quality sheet pan, I keep a stack of these in my kitchen. And they don’t need to be expensive. Just make sure you keep the food from touching each other/in a single layer for optimal roasting. Loved this recipe, I cooked half of the recipe for my husband and I last week and we just loved it, I am doing it again tonight for a dinner party, will be making the whole recipe this time. 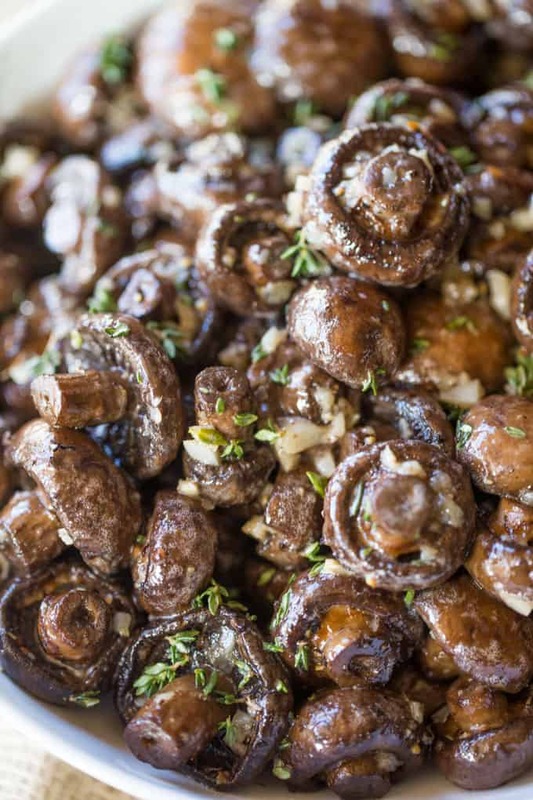 What kind of mushrooms are you using in this recipe? 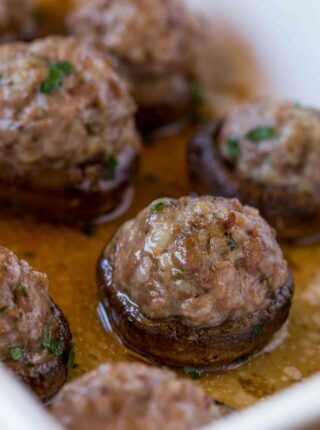 I used white button mushrooms but you could also use cremini mushrooms. I hope you enjoy it! Waooo.. I tried making it & it came out delicious..!!! One more recipe in my forever cookbook..!!! Thanks!! Thank you very much for the recipe and for the suggestions as well ! Hope you will have a nice week ! Seriously gorgeous! 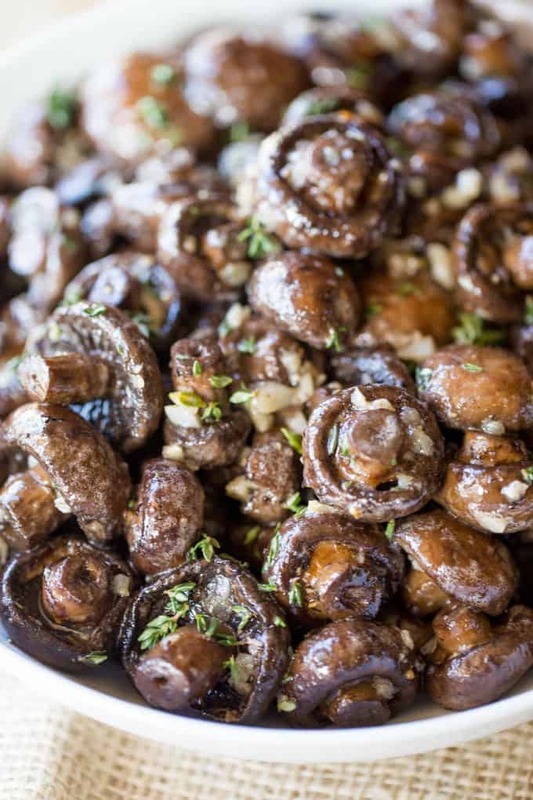 I have a garlic rosemary roasted mushroom recipe I love to make, and will now need to try your buttery version. Oooh, garlic rosemary sounds fantastic as well! These sound amazing! I want to grill up a steak to go with them! I’ve never seen mushrooms look so good! Seriously, YUM! J’adore les champignons au beurre et à l’ail. 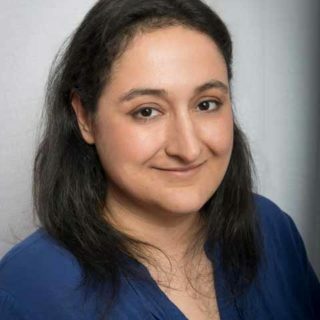 Je ne connaissais pas la façon de faire au four. 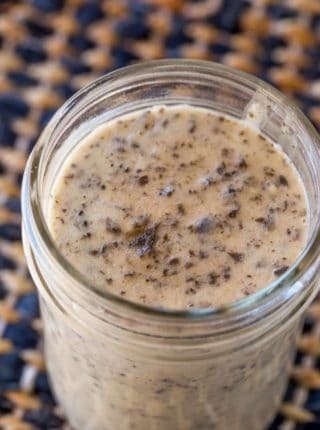 Je suis content que vous ayez trouvé cette recette pour que vous puissiez essayer! These are making my mouth water! So delicious as an appetizer, side dish, or MEAL!! You’re right! They’re so delicious I can’t stop eating them so they could definitely count as my dinner, haha! I’m not the biggest mushroom fan, but that garlic butter sauce might make me a fan yet. 😉 If nothing else, I know my husband and daughter will ADORE these! Wow! If I had these and a steak I would be the happiest person ever!